The very best in pet nutrition! - Grain Free recipes are ideal for dogs with sensitivity to grains or gluten; a great alternative to rice or cereal-based products. They are also great value for a quality pet food with 50% meat content! - Grain Free recipes may help to alleviate some symptoms of grain sensitivity or intolerance. Other potential benefits may be smaller poos (less to pick up! ), reduced shedding & improved coat. - Our Naturals range offers a Super Premium dog food that contains fresh meat, natural prebiotics and Omega 3, Alfalfa (aids digestive tract) and Yucca extract to help reduce stool odour. - Ideal for dogs with a delicate digestion, and helps maintain excellent body and coat condition.Highly digestible, less to clean up when you are walking the dog! - If you have an active working dog breed such as a Border Collie, Labrador, Golden Retriever, Spaniel or some of the many breeds of terrier then you might want to take a look at this range, as it's VAT free! - The recipes, including Grain-free, are exactly the same as our other ranges, just in plain packaging and offering you a good saving on the cost/kg of dog food. 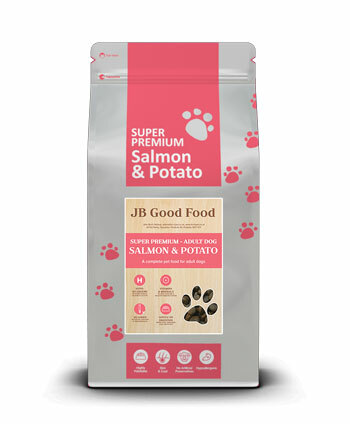 - The Super Premium range offers a variety of tried and tested dog food recipes, from puppy/junior through to senior, all developed by pet nutritionists to ensure that your dog gets the very best. - These are hypo-allergenic, designed to keep your pet in the very best of health, less prone to problems of itchy skin and delicate digestion that some can suffer from.